Product overview by Vlad Catrinescu – requested by harmon.ie, but thoughts are my own. Information Overload is a growing problem both in the workplace, and in life in general. Information Overload is when you are trying to deal with more information than you are able to process to make sensible decisions. The result is that you either delay making decisions, or you make the wrong decisions. And let’s be honest, we all feel a kind of information overload because of all of the sources of information we have today. If you are an office worker, you have to go get all the information from SharePoint, email, Yammer, and other systems you might have such as Zendesk, Salesforce, etc. 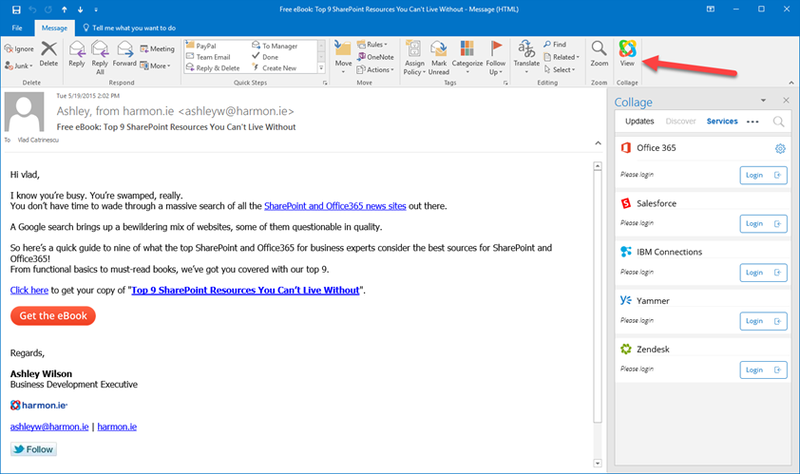 harmon.ie latest Outlook Add-in called Collage aims to solve that problem, by using the latest available tools such as Microsoft’s Office Graph API and machine learning. Before starting the review, here are some words from the harmon.ie website! 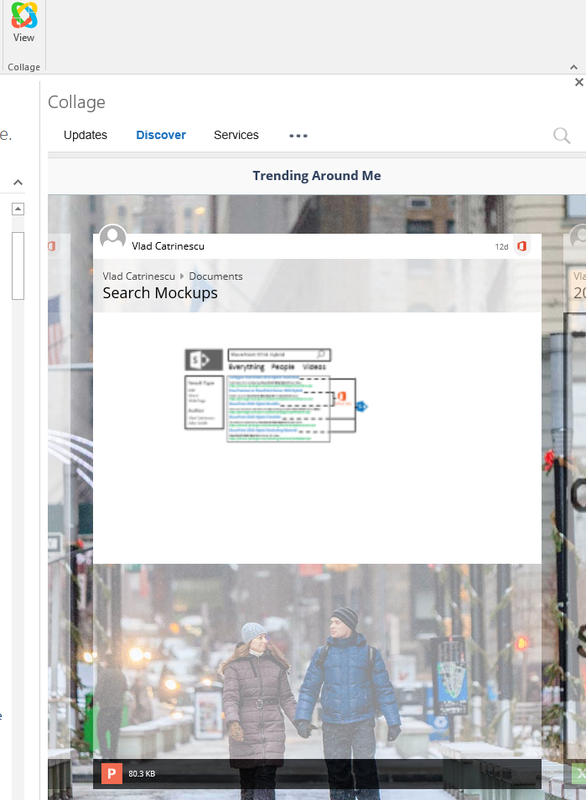 Collage is the world’s first ‘topic-driven’ interface; it turns your Outlook window into the one place where all your important business information comes together…organized by topic. 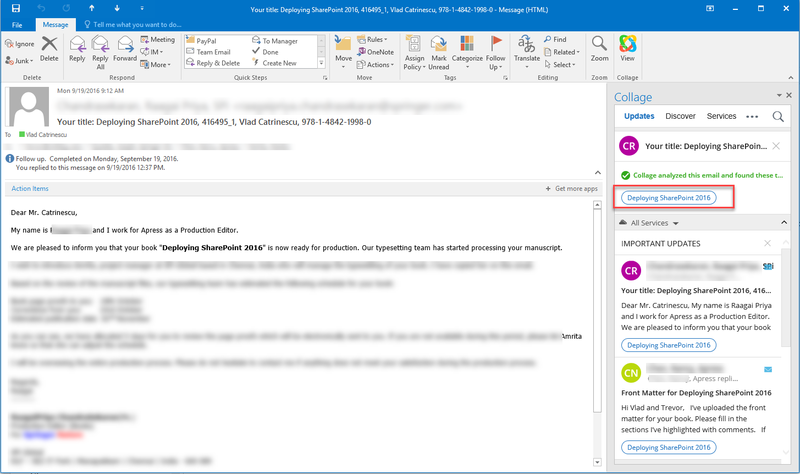 Simply view an email message and all related information from business apps, documents, or social updates appears in the Collage Outlook sidebar. Making sense of all your disconnected information has never been easier. Collage uses machine learning and natural language processing (NLP) to automatically discover topics contained in business app notifications, email messages, documents, and social posts. Collage employs sophisticated matching algorithms to pair topics across many information sources. 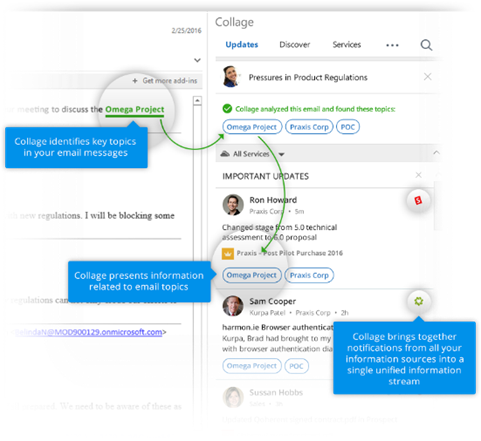 Collage brings together notifications from all your information sources into a single unified information stream, displayed conveniently in an Outlook add-in. harmon.ie Collage is installed as an Outlook Add-in directly from the Office Store. After Installing it, I decided to run it against my real main Inbox. Usually I run reviews on random accounts, however since Collage looks at my emails and assigns topics to them, I really needed an active Mailbox with a lot of context to be able to review its functionality. Since it’s my real mailbox, some items may be blurred, but you’re getting the real thing! Once I added the Add-in, the first thing I had to do was add all my services. Similar to the other harmon.ie Add-ins, you can easily access it from the Ribbon, and it will open as a side panel in Outlook. You can log in to all the services you use, by clicking on the Services tab, and then logging in to each service you use. I don’t have Zendesk, IBM or Salesforce, so I only connected to Yammer and Office 365. After that, I opened one of my emails for a project I have been working on the past year, which is my book on Deploying SharePoint 2016. As you see in the screenshot below in the red rectangle, Collage analyzed my email and found out that the topic is “Deploying SharePoint 2016”. In the Collage sidebar, I also see all the other emails that talk about the same topic, whatever service they are from. In this particular screenshot, they all come from email. Pretty cool! As all machine learning is not perfect, some of the topics that harmon.ie picks provide no valuesuggests are not interesting. , or do not make any sense. For example, I have emailed a company to reserve something, and mentioned a MasterCard Priceless special price. 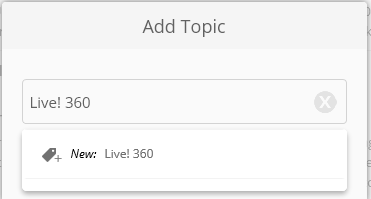 I can right click on a topic and select to Ignore this topic. In this way, users can train Collage which topics are real, hence improving Collage’s ability to interpret and pick out topics of interest. As a side note, you can see that other than the Blue MasterCard Tag, Collage also identified another tag for my email which is UTC. Secondary tags for the same item will be shown in Gray, and you can also click on them so you can search for this secondary topic. harmon.ie Collage, also allows you to ignore certain users if you wish so. I can go and see my list of Ignored Topics anytime from the Collage Settings. Something I can do incase harmon.ie didn’t pick a topic on an email that I want, is to manually tag it from the timeline, and add a tag to it. In my case I added a new topic called “Live! 360” to this email. Again, as users manually tweak the set of topics, Collage gets better at surfacing interesting topics. Something that I wish that Collage would let me do, but it doesn’t at the moment is to tag the current email that I have open. When I open an email and Collage doesn’t find any relevant topics, it shows that “Collage didn’t find relevant topics for this email”, but does not allow me to add my own from this view. , I have to find the same email from the timeline, and add it from there. I think that this is definitely a feature that I would want to have, and would love to see it included in a future update. harmon.ie Collage also has a Discover Tab, which allows you to see trending documents around you, and show you documents that the Microsoft Graph thinks you might find interesting. The idea is really good, and it works well to identify recently changed documents. One minor quibble I had with Collage was that it could not open documents in my default browser, Chrome and instead opened everything in Internet Explorer. It turns out that because the Collage add-in (and all Outlook add-ins) runs in Outlook inside Internet Explorer (Microsoft AddIns Web architecture), there is no option other than opening the document in Internet Explorer. In this blog post, we have reviewed harmon.ie’s latest product called harmon.ie Collage. Collage is an Outlook add-in that locates and displays all information related to those topics in the same Outlook window – information from applications, documents, other emails, and social interactions. 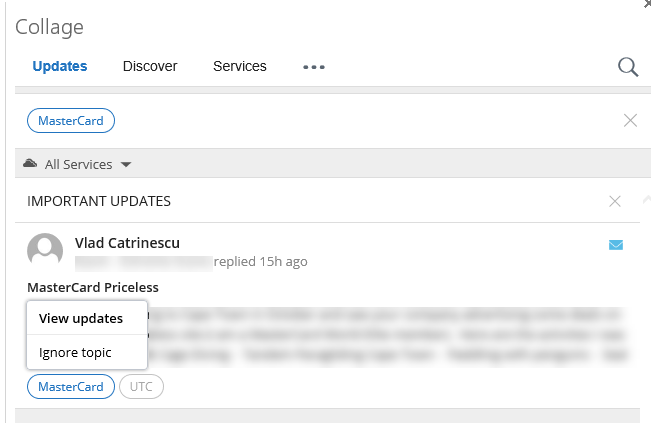 It can currently connect to Office 365, Salesforce, IBM Connections, Yammer and Zendesk and get information from all those sources, in the Collage sidebar. Microsoft Dynamics is on the way. During my testing, I have found Collage to be really useful, and it was able to identify most of my emails with the correct topics, and allowed me to easily find emails for the same projects, without going to other folders of my email and doing other searches. Something that I wish that Collage had, was the ability for me to tag the currently open email directly, and not only from the timeline, which would allow me to tag items faster. The Discover tab also showed me useful documents from my SharePoint Online tenant, which I found a cool feature. As with the other harmon.ie products I have reviewed in the past, the quality was top-notch, I didn’t encounter any strange or unexpected behavior, and the interface was super easy to use, without ever needing to open the instructions manual. If you want to get all the information you are looking for, from multiple systems, directly in your Outlook window, make sure to check out harmon.ie Collage by clicking on the banner below! I am extremely happy to announce that my fifth Pluralsight course has been released this weekend, and this one is on the latest and greatest version of SharePoint! In this course, Planning for SharePoint Server 2016: Physical Topology and Services, you’ll learn foundational knowledge in order to properly plan for a SharePoint 2016 topology according to your business needs. First, you’ll learn how to architecture a topology in Traditional, Streamlined, and MinRole strategies. Next, you’ll learn how to plan for your Service Applications such as Search, User Profile, and the Productivity Service applications, as well as how they can affect your Physical Topology. 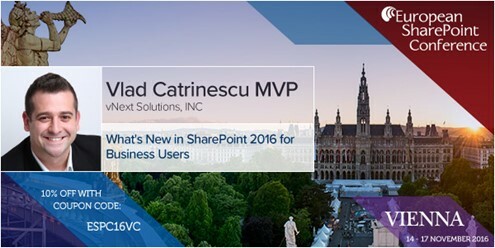 Finally, you’ll learn how to plan for SharePoint Hybrid, Business Intelligence, SharePoint 2013 Workflows, SharePoint add-ins and more. The Word Automation Services Service Application is a Service Application that automatically converts documents supported by the Word client application into formats such as PDF and XPS. In a simpler way to explain it, the Word Automation Services takes the “Save As” functionality of the Word client, and replicates the functionality on SharePoint. However, the Word Automation Service Application, does not have a user interface to test that it was configured properly. The only way to actually Test the Word Automation Service Application is trough code, which as a SharePoint IT Professional, I don’t want to write code simply to test a Service Application. Luckily, PowerShell is there for us! By using PowerShell, we can convert a document from Word to PDF, and test that this service application is working properly! We will first load the assembly required to call Word Automation Services functions. We then create new Object of type ConversionJobSettings specifying the Output format is PDF. $jobSettings = New-Object Microsoft.Office.Word.Server.Conversions.ConversionJobSettings $jobSettings.OutputFormat = "PDF"
We then create a new object of type ConversionJob and give it our Service Application Proxy Name, in our case Word Automation, as well as the $jobsettings object. We then set the $Job.Usertoken to the SharePoint SPWeb where the document is stored. Lastly, we add the properties for the file that we want converted. We give it the URL to the Word Document, as well as the URL to the future PDF document, which does not exist yet. We then Start the Job. The Word Automation Services job runs asynchronous, meaning that we won’t know when it will run directly from PowerShell, however we can force the job to run right away by starting the Word Automation timer job. Add-Type -Path 'C:\Windows\Microsoft.NET\assembly\GAC_MSIL\Microsoft.Office.Word.Server\v4.0_16.0.0.0__71e9bce111e9429c\Microsoft.Office.Word.Server.dll' $jobSettings = New-Object Microsoft.Office.Word.Server.Conversions.ConversionJobSettings $jobSettings.OutputFormat = "PDF" $job = New-Object Microsoft.Office.Word.Server.Conversions.ConversionJob("Word Automation", $jobSettings) $job.UserToken = (Get-SPWeb https://sharepoint.learn-sp2016.com).CurrentUser.UserToken $job.AddFile("https://sharepoint.learn-sp2016.com/Shared%20Documents/Document1.docx", "https://sharepoint.learn-sp2016.com/Shared%20Documents/Document1-Final.pdf") $job.Start() Start-SPTimerJob "Word Automation"
To see the status of the job, run the following PowerShell cmdlet where “Word Automation” is the name of your Word Automation Services Application. Initially it will show as InProgress since we force started the Timer Job as seen in the screenshot below. Once the job is completed, it will either show as Succeeded or Failed. If everything was configured correctly, it should show as Succeeded as seen in the screenshot below, and you should see your PDF document in your document library.